Have you ever wondered what other people might be able to see in your handwriting? Reasonable curiosity, to be sure: People indeed can see some interesting things about you looking at your handwriting. Certainly a program like this is no substitute for one of us personally examining your handwriting, but it's a place to start. A ) An automated handwriting analysis is only as good as its data... So be mindful when you're punching choices; it can make a difference. B ) Try not to think too hard about it; if you don't get it right the first time you can always click "Back" and try again. C ) If you like the concept of this interesting little sample format to use to learn about other folks' handwriting, then: Learn more! 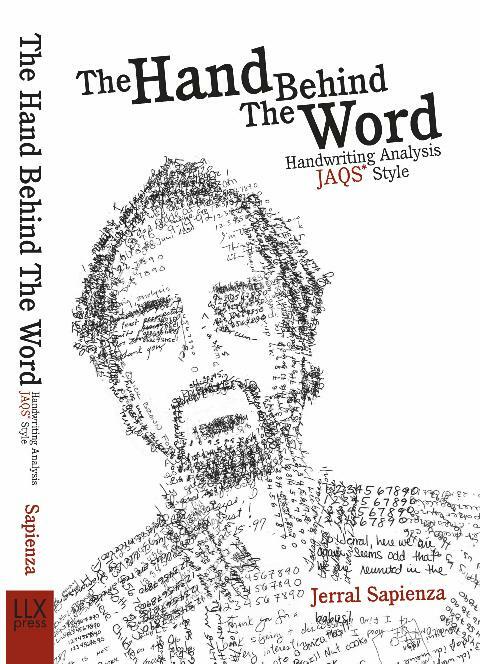 Check out the new book, The Hand Behind The Word, a step-by-step intriguing intro to this "JAQS" form of Handwriting Analysis. You'll be asked several questions about different aspects of your handwriting (or the handwriting you're looking at) and you will be asked to choose ONE answer from the list of possible answers. Then, putting it all together from the answers you give, we'll print you out a report which reflects a rudimentary read for the particular traits you said you found there in your hand (handwriting.) But be mindful that there's always apt to be a bit of a catch here which you may want to be aware of... Because we're relying on you to be the EYES of the program here, and what YOU may consider a truly left-leaning hand may not to an analyst look so much left-leaning as you think. Or when asked to evaluate the space in the left margin, if you make a different call than someone else, then you might get a different answer. To most effectively use this system, please review the Standard Format we request for a sample, and/or some of the Examples and then write out a sample in that format to use to answer the following questions. Size of signature compared to the rest of your HW? Take a look at how you wrote the paragraph there. Some people write cursively so neat it might as well be what we saw in school above the blackboard there... and some people mix CURSIVE and MANUSCRIPT (WRITING and PRINTING) and some write almost totally in PRINTING (and sometimes even all in all CAPS.) What does yours look like overall? common references in Astrology & Astrological Studies. Suitable for printing out, what name would you like displayed at the top of this report? a step-by-step intriguing intro to this "JAQS" form of Handwriting Analysis. © 1995 - 2019 by Lifelong Learning Excellence, Inc.